Daikin’s VRV systems ... now Eurovent certified. Daikin Industries, a Japan-based HVAC (heating, ventilation and air-conditioning) leader, has launched the GCC’s first commercialised high ambient air-conditioning system to use R32, an alternative refrigerant to R22 with zero ozone depletion potential and lower global warming impact than R410A refrigerant. “The unique combination of R32 and inverter technology in the new Daikin air-conditioner range offers end-users the opportunity to benefit from class-leading energy efficiencies, with excellent cooling capacity and high indoor climate comfort, while lowering the environmental impact,” says Sana Hamdani, product marketing manager of Daikin Middle East and Africa. 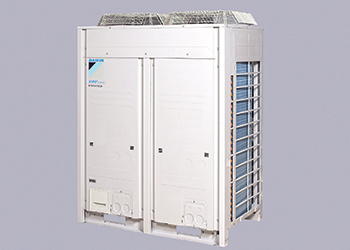 Daikin’s wall-mounted cooling only and heat pump air-conditioners come in three capacities: 18, 24 and 28 MBH (1,000 British Thermal Units per hour). “By incorporating the best available technologies, these units offer the best nominal and seasonal efficiencies in line with real-life Middle East operating conditions,” Hamdani says. “They can achieve high energy efficiency ratio (EER) (Btu per kWh) in cooling of up to 13.3 at T1 conditions (35 deg C) and up to 8.6 at T3 conditions (46 deg C), exceeding the most stringent regulations of the region and making them the most energy-efficient air-conditioner of their type in the market. The units are whisper quiet with sound pressures as low as 32 dBA (A-weighted decibels). They deliver an improved air flow pattern, reaching the furthest corners of a room. An ‘intelligent eye’ will further enhance the energy efficiency without compromising the comfort by adjusting the set point according to the occupancy level of the room. The system comes with a user-friendly wireless control. Moreover, all units have a Titanium Apatite air purification filter to improve air quality by absorbing and decomposing microscopic particles and organisms, while removing odours. An R32 unit ... lower environmental impact. R32, a chlorine-free, single-component refrigerant, is said to have a global warming potential of about one-third of the more commonly used refrigerant R410A. Up to 15 per cent less refrigerant is needed compared to an equivalent air-conditioner system with R410A according to Daikin. 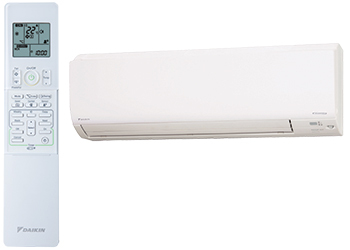 Globally, Daikin R32 air-conditioners were also introduced in many markets such as Australia, Europe, New Zealand and Asia. In Japan alone, approximately five million units were sold by Daikin, out of the eight million total sales. In the US, the Environmental Protection Agency (EPA) announced on March 10 the approval of R-32 refrigerant for use in certain air-conditioning applications. Michel Farah, the product planning director, says Daikin is renowned for its pioneering approach to product development, with more than 90 years’ experience in the design and manufacture of air-conditioning technologies. “As part of its serious commitment towards the environment, Daikin aims at developing systems that improve comfort levels while having a low environmental impact. Refrigerant choice is a key factor in the drive to maximise energy efficiency and to minimise the global warming impact of systems,” Farah says. Furthermore, Daikin’s range of air-cooled VRV (variable refrigerant volume) systems including High Ambient models are now certified by Eurovent. The certification provides added reassurance to Daikin customers of exceptional quality and high performance and demonstrates that the company’s Europe-sourced VRV range works in conformity with the specified efficiencies. “Daikin is proud to have the first Eurovent-certified High Ambient VRF system in the GCC,” says Farah. Headquartered in Osaka, Japan, Daikin is one of the world’s largest manufacturers of heating, cooling and refrigerant products, with more than 56,000 employees worldwide. It is engaged primarily in the development, manufacture, sales and aftermarket support of air-conditioning, heating, ventilation, refrigeration equipment, refrigerants and other chemicals, as well as oil hydraulic products.